TECHNICOLD® offers a line chilled water air conditioning and water heating systems for environmental climate control of the marine vessel, both power and sail. The climate control systems are designed for the marine environment, constructed with 316L stainless steel and other quality corrosion resistant materials providing years of corrosion free service while maintaining the original new appearance. TECHNICOLD® chilled water air conditioning systems incorporate one or more self-contained water chillers that can be located separately or placed in a rack for ease of service in one central location. 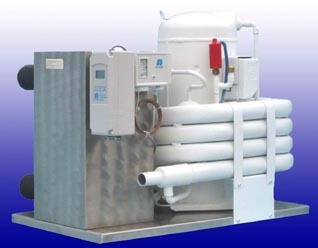 TECHNICOLD® water chillers are constructed in the smallest attainable size to take advantage of any and all feasible installation locations. A closed loop water circuit circulates tempered water throughout the vessel. Each area or cabin has an individual zone control valve and air handler which thermostatically controls a desired temperature. Each modular chiller is staged to cycle on or off as the cooling loads vary in the vessel enabling a preset water temperature to be maintained for optimum efficiency. TECHNICOLD® climate control systems are available in straight cooling, cooling and heating by reverse cycle, or cooling and heating by electric resistant. Additionally, oil fired heat may be added. Systems are standard with scroll compressor, conventional piston compressors are available. Tropical Marine Air Conditioning, Inc. services and sells marine equipment and Technicold A/C marine parts- Marine Air, AquaAir, Technicold, and Cruisair air conditioning, refrigeration by U-Line, Spot Zero and Sea Xchange, ECOmar Sewage Treatment Systems, and ice machines Eskimo Ice. CONTACT US for your marine parts and equipment needs.